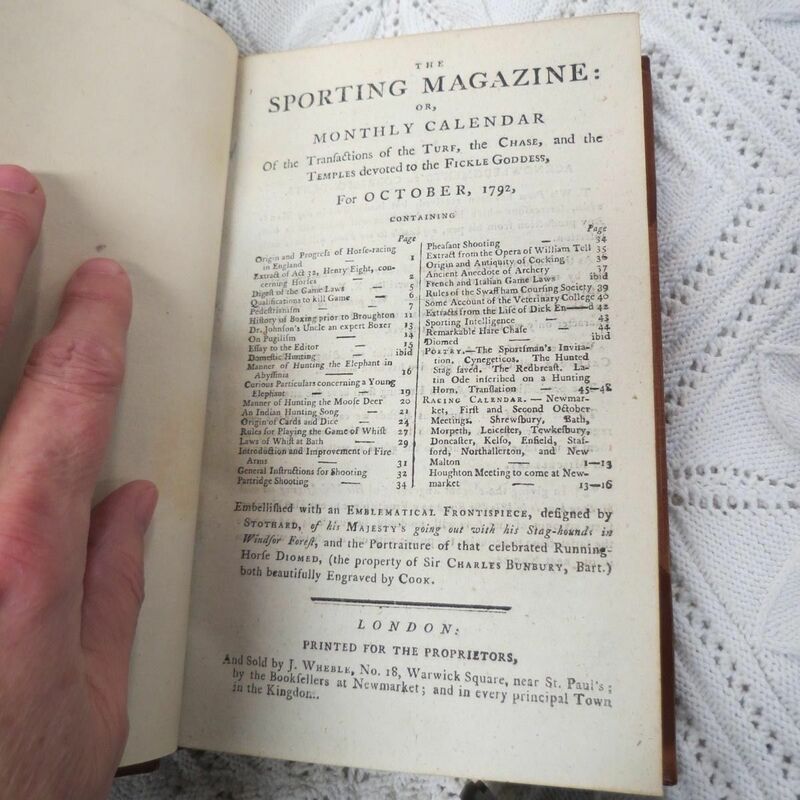 Sir Richard's is proud to present the rarest, complete set of the Sporting Magazine compiled by Fred S. Banks and published by Sir Walter Gilbey, consisting of 156 gilt bound volumes of the "Sporting Magazine" commencing October, 1792 and continuing until December, 1870. Plus the rare October, 1892 one volume "Index of Engravings with the Names and the Artists in the Sporting Magazine from the Year 1792 to 1870." A 1960 Sotheby's catalog page advertised this set for sale and stated, "A VERY FINE SET, ....from the Estate of Esquire Moore Stevens. This fine set has been said to be the finest, complete set in the World. This set is so impressive and sought after that another set in this condition will be impossible to find. These sets were done by Sir Walter Gilbey only for Royalty and Universities and from what we have found, not many are in existence. A similar set was sold at Christies, London in 2006, lot 724, sale #7300 for $128,000.00 and was not near the original condition of this set. Theirs was said to have a Bumpus binding and they stated that their set did not conform to the ideal. 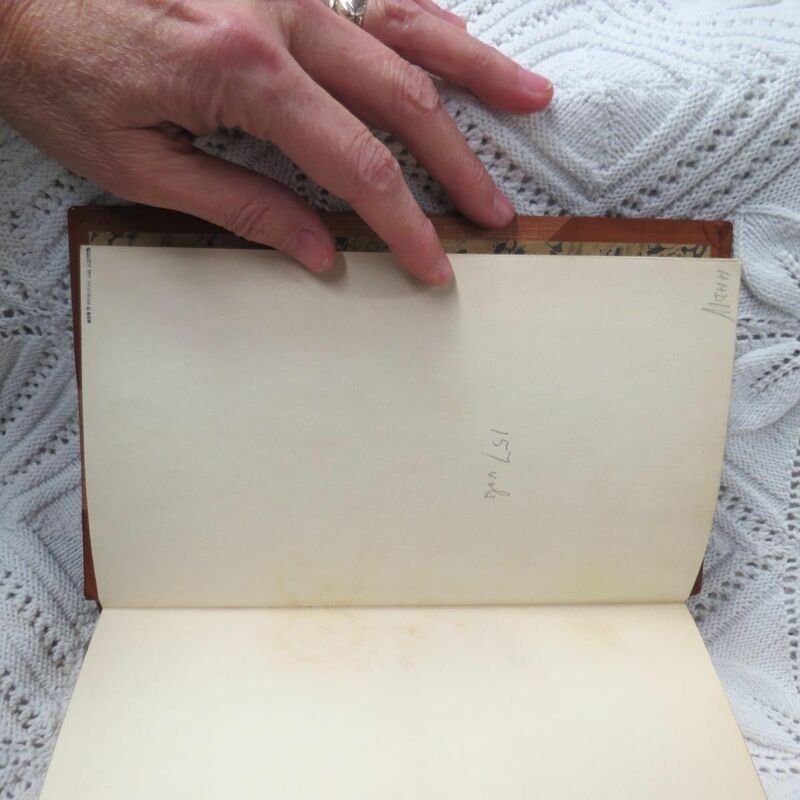 The fact that Christies set brought $128,000.00, well above the estimate, shows that more than one person in the World was close to that amount in bidding, hoping to win the books for themselves. The gorgeous 157 bindings on our set, however, were done at a great expense at that time, executed and marked by Riviere & Son and are of half calf in medium red brown with embossed gilded animal scenes and dates red and green toning on the back spine. The back boards are framed in with line gilding. 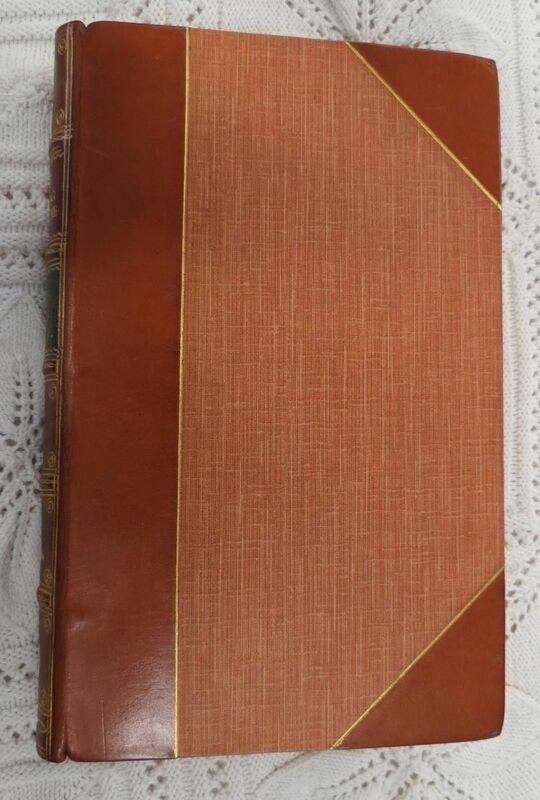 The front and back covers are half calf and reddish-brown silk. The top, front and bottom of all the pages are beautifully gold gilded. 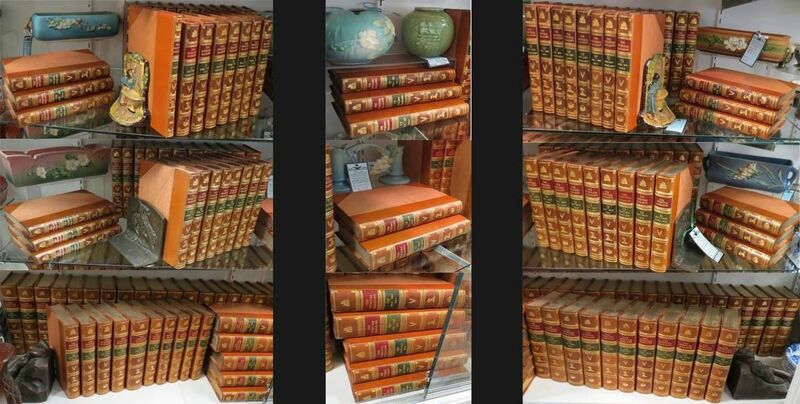 Just to get a set of 157 volumes bound today in this same manner would easily exceed $55,000.000 just for the bindings. If you would like to come yourself or send a representative, this beautiful set is available for viewing at our place of business 10 to 5, 7 days a week.This set would make a wonderful present for your partner that will forever be remembered. 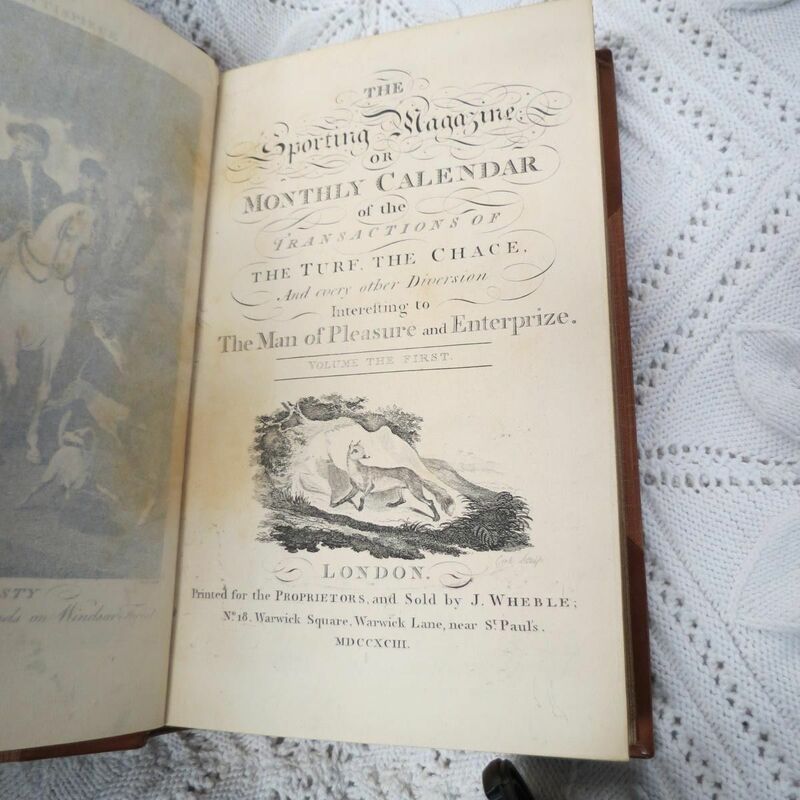 The books have over 2,000 steel plate engravings, plus is a complete wealth of sporting knowledge dating back from 1792 to 1870. Not only will this set be an excellent selection for fireside reading, but the artistic covers will make a rich statement in your formal library. The artists plates include the rarest artists of the times including, Henry Alken, Harry Hall, the Herrings, Howitt, Marshall, the Sartorius's, F. C. Turner, A. Cooper, the Ferneleys, George Moreland and others. The rare index, published in 1892, includes all the works of the artists who contributed and are all listed except for 8 plates not included, in time to celebrate the centenary of the beginning of the magazine. Less than 10 complete sets that we have found have ever come up for sale since its existence. This set is the "creme de la creme" of sporting books and very important being the finest example in the World known to exist, having the original bindings. These sets are extremely rare and almost impossible to find outside of Universities and Royal families. 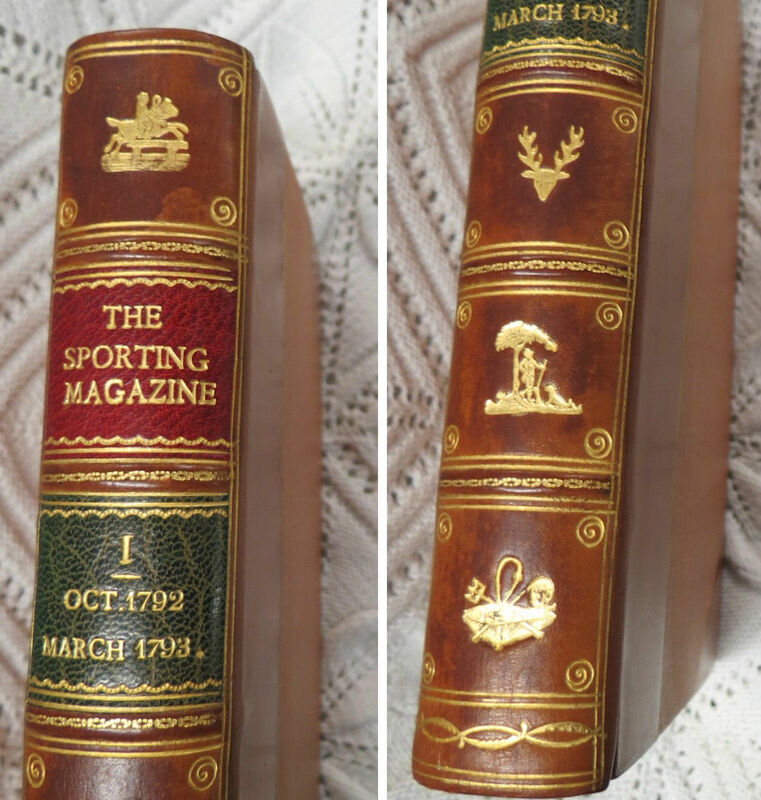 Sir Richard's is proud to present the rarest, complete set of the Sporting Magazine compiled by Fred S. Banks and published by Sir Walter Gilbey, consisting of 156 gilt bound volumes of the "Sporting Magazine" commencing October, 1792 and continuing until December, 1870. Plus the rare October, 1892 one volume "Index of Engravings with the Names and the Artists in the Sporting Magazine from the Year 1792 to 1870." A 1960 Sotheby's catalog page advertised this set for sale and stated, "A VERY FINE SET, ....from the Estate of Esquire Moore Stevens. This fine set has been said to be the finest, complete set in the World. This set is so impressive and sought after that another set in this condition will be impossible to find. These sets were done by Sir Walter Gilbey only for Royalty and Universities and from what we have found, not many are in existence. A similar set was sold at Christies, London in 2006, lot 724, sale #7300 for $128,000.00 and was not near the original condition of this set. 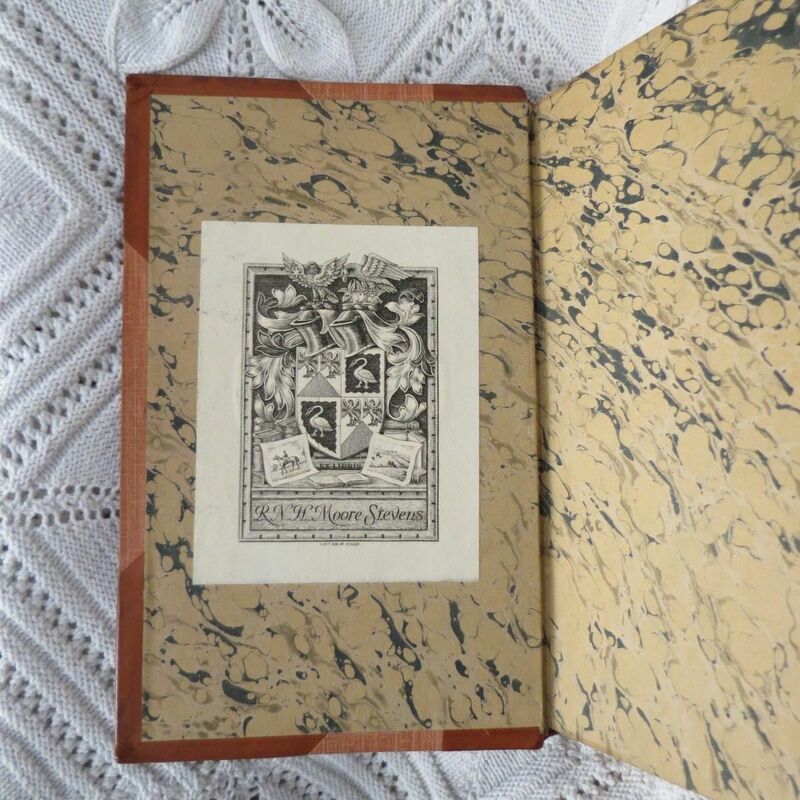 Theirs was said to have a Bumpus binding and they stated that their set did not conform to the ideal. The fact that Christies set brought $128,000.00, well above the estimate, shows that more than one person in the World was close to that amount in bidding, hoping to win the books for themselves. The gorgeous 157 bindings on our set, however, were done at a great expense at that time, executed and marked by Riviere & Son and are of half calf in medium red brown with embossed gilded animal scenes and dates red and green toning on the back spine. The back boards are framed in with line gilding. 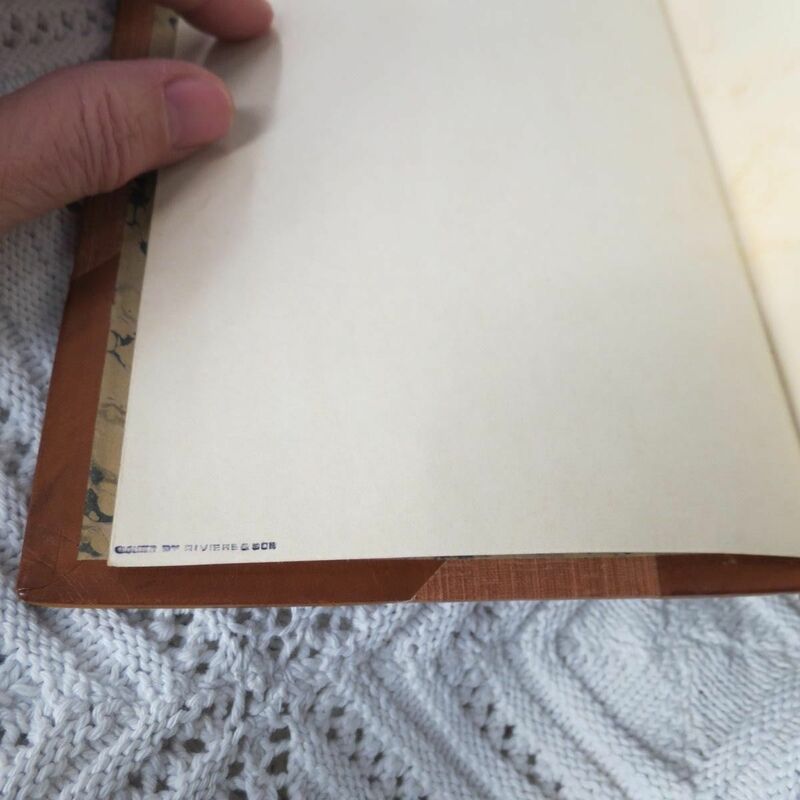 The front and back covers are half calf and reddish-brown silk. 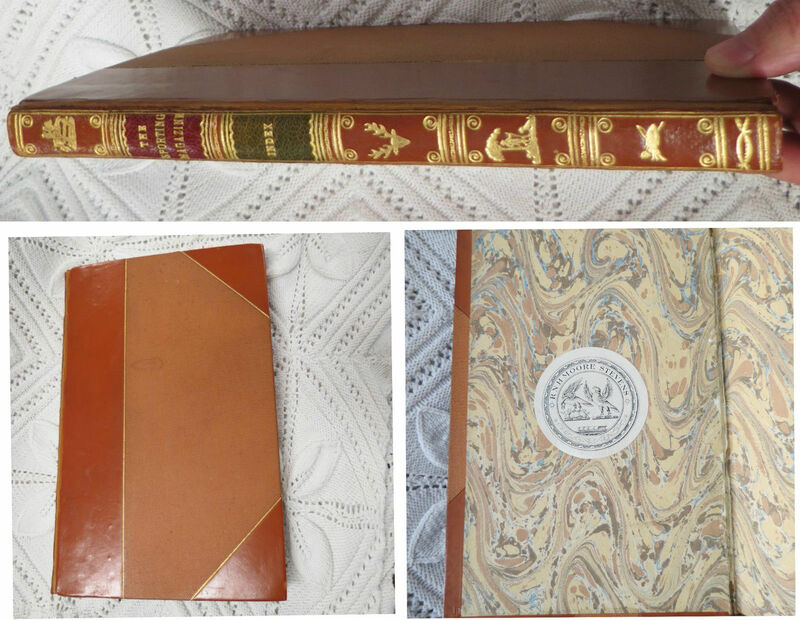 The top, front and bottom of all the pages are beautifully gold gilded. Just to get a set of 157 volumes bound today in this same manner would easily exceed $55,000.000 just for the bindings. If you would like to come yourself or send a representative, this beautiful set is available for viewing at our place of business 10 to 5, 7 days a week.This set would make a wonderful present for your partner that will forever be remembered. 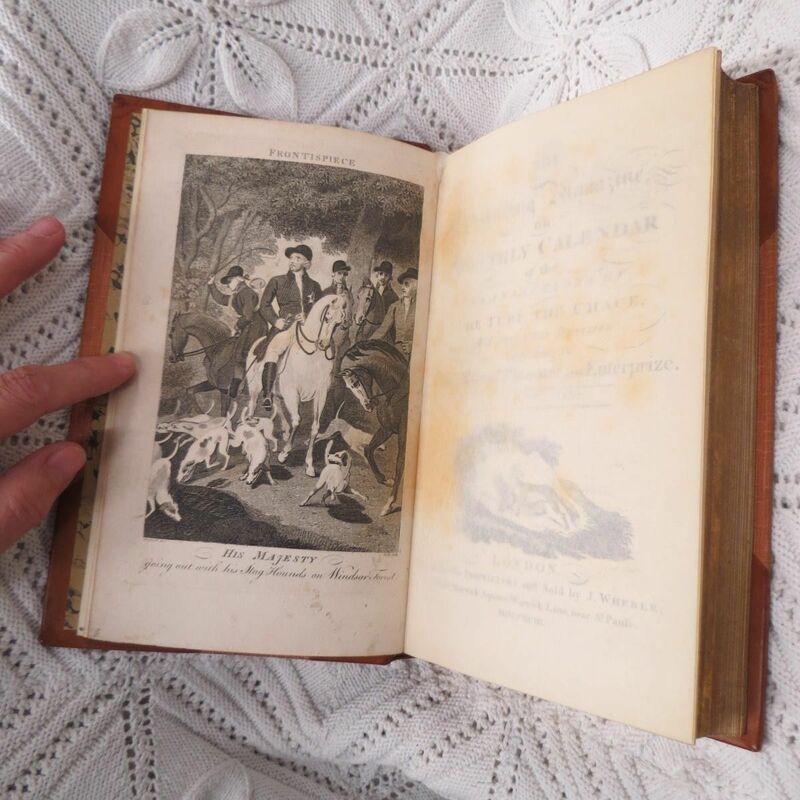 The books have over 2,000 steel plate engravings, plus is a complete wealth of sporting knowledge dating back from 1792 to 1870. Not only will this set be an excellent selection for fireside reading, but the artistic covers will make a rich statement in your formal library. The artists plates include the rarest artists of the times including, Henry Alken, Harry Hall, the Herrings, Howitt, Marshall, the Sartorius's, F. C. Turner, A. Cooper, the Ferneleys, George Moreland and others. The rare index, published in 1892, includes all the works of the artists who contributed and are all listed except for 8 plates not included, in time to celebrate the centenary of the beginning of the magazine. Less than 10 complete sets that we have found have ever come up for sale since its existence. This set is the "creme de la creme" of sporting books and very important being the finest example in the World known to exist, having the original bindings. These sets are extremely rare and almost impossible to find outside of Universities and Royal families.